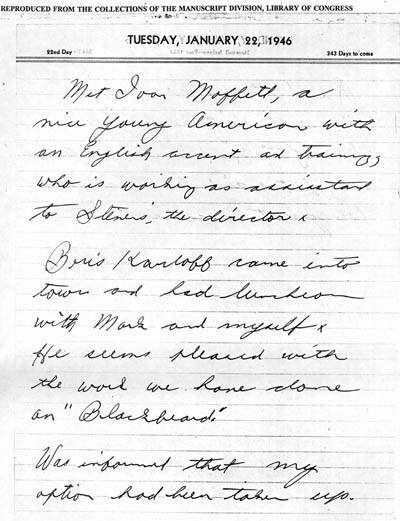 (Above, middle paragraph) "Boris Karloff came into town and had lunches with Mark and myself. He seemed pleased with the work we had done on "Blackbeard." [Quote above] From Edmund G. Banzak's Fearing the Dark: The Val Lewton Career, published by McFarland & Company, 1995, page 426. 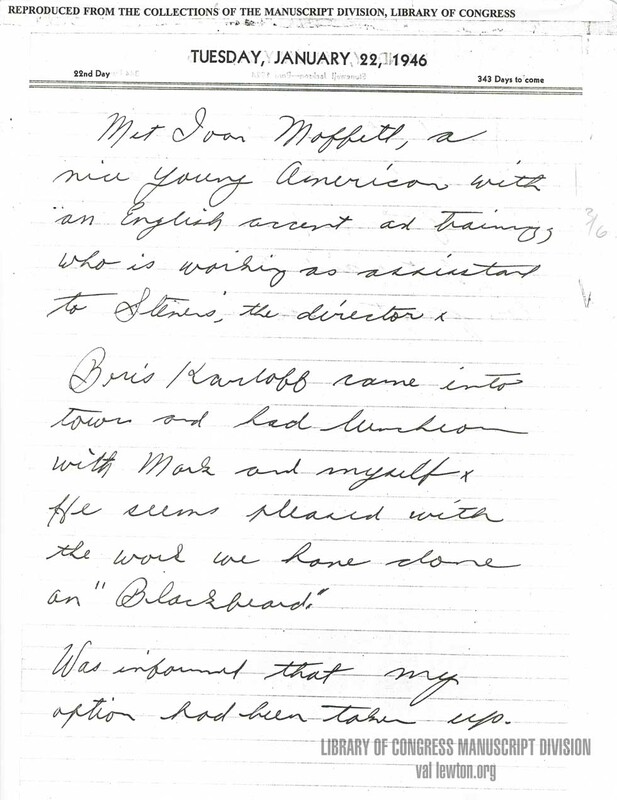 Seventh Victim: Page 33 (Script dated May 12, 1943): Dr. Judd "I'm sorry. I don't practice anymore. I find it easier to write about mental illness and leave the cure of it to others." Lewton's last major story-editor work for Selznick. A Hitchcock and Selznick film. Lewton is known to be responsible for having the title characters suicide segment of the story kept as it is presented versus the ending that Hitchcock & Selznick pursued. Lewton fundamentally ran interference for negotiations with the Breen office that approved film content for ratings. Independent Selznick films. As Selznick's assistant, Lewton worked as a story editor, consultant and contributor (particularly on Nothing Sacred, according to Banzak's book). Lewton had been pushing Selznick for an adaptation of War and Peace, but instead was forced into production on this story which he disliked. Supposedly Lewton was the originator of the vast wounded-confederate railway depot scene, besides his usual chores for Selznick as an uncredited script editor and contributor. Independent Selznick films. As Selznick's assistant, Lewton worked as a story editor, consultant and contributor. As Selznick's assistant, Lewton worked as a story editor, consultant and contributor. MGM Productions. Unproduced Selznick film. Lewton hired to write film treatment.